Vraic is the word we use to describe our local seaweeds. And seaweed is a loose term covering a wide range of marine algae and plants. Generally these seaweeds are divided into groups of red, green and brown algae. To flourish seaweeds need seawater or brackish salty water and generally need to be covered by the seawater each day. They also need enough light for photosynthesis to grow and need something to attach there hold-fasts too so are usually found on rocks rather than sand or shingles. In Jersey we are lucky to have a vast tidal range and our solid granite rock geology combined gifts us with a vast range of diverse species of vraic. There is nothing new about using vraic as a natural fertilizer and tonic for your soil. Jersey growers know better then anyone the benefits of using the sea's magic elixir. It has always been there on the shore just waiting to be put to good use. 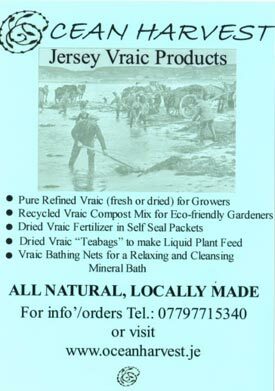 It is our aim to bring back the use of Jersey vraic and produce the best all around home-made compost products for small growers. From a grower's perspective if you plant Jersey Royals you cannot go wrong in using this gift of the sea. In fact whatever you decide to plant by using Ocean Harvest vraic products you will notice improved growth and stronger plants that will reward your efforts. For a comprehensive range of our products please refer to our products page. All the products are available to order directly by email or by phoning Paddy on 07797 715340.